Click here to go to NSCC's collection of Montie SafetyCare Videos. New interface, now available off campus. Montie SafetyCare is a video library of Workplace Health & Safety and Skills Training videos. * All Montie SafetyCare videos can be shown in the classroom. ** SafetyCare offers Closed Captioning. Click on More Info in the bottom right-hand corner of each video to see a full video description. Once the description box opens up, you will see an Embed button that will give you the code to embed videos in presentations or course management systems and/or the link to save and access videos at any time. You can now also EDIT your embedded videos! Check out the Safetyhub "Hot To" document below. Use Montie Safetycare Off Campus! Link from the streaming video page on the library services website. 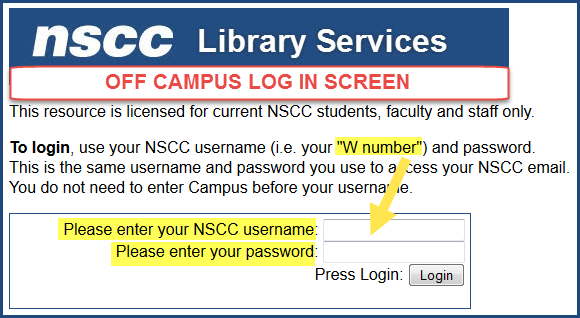 Enter your W# and password into the Off campus Login Screen.